The start of the Royal College of Nursing’s 100th year will be celebrated with the production of a traditional embroidered marching banner. Discovering that Townswomen’s Guilds had members with the necessary traditional design and making skills, the college has been working with experienced needlewomen in the organisation to produce the banner. standards for nurses, in their education, practice, and working conditions. Today the RCN has around 430,000 members, and is uniquely acknowledged as the ‘voice of nursing’ by both the government and the public. With its history in mind, the college felt that the commissioning of a new banner would be a fitting start to the centenary. 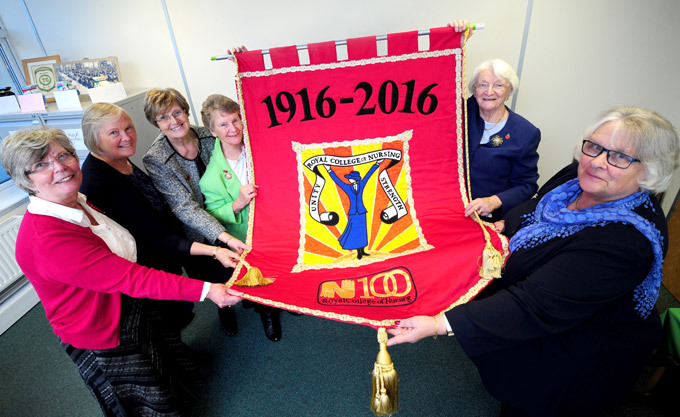 Following January’s presentation, the RCN Centenary Banner will travel to nursing establishments around the UK. HRH The Princess Royal to attend Townswomen’s Guilds 2018 AGM at Brighton Dome - National women’s organisation the Townswomen’s Guilds (TG) are happy to announce the attendance of Her Royal Highness The Princess Royal to the 2018 Annual General Meeting (AGM). The Princes Royal is a Patron of the national women’s organisation. The One Sock Show - Step up, step up! This year, instead of a competition we have decided to arrange an exhibition called “The One Sock Show” at this year’s AGM in Sheffield.